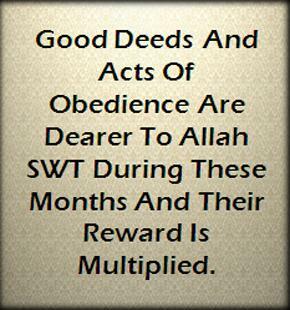 Good deeds and acts of obedience are dearer to Allah SWT during these months and their reward is multiplied. The month of Rajab is most famous for the event of the night journey and ascension of Prophet SAW to the heavens, in Arabic known as Al-Isra wal Mi’raj. The exact date of this journey is unknown, however all Islamic scholars are in agreement that it took place in the month of Rajab. Al-Isra refers to Prophet SAW’s journey to Jerusalem where he led all the previous prophets in prayer, and Mi’raj refers to his journey to the heavens. This miraculous journey is very significant and has a direct impact on daily lives of Muslims as it was during this journey that our Prophet SAW had the glimpses of wonders of paradise and torture of hellfire, along with the gift of salah (obligatory prayers) which was granted during this trip. Apart from these, there are many lessons that we can learn from this event. In order to fully grasp the significance of this journey, we should appreciate the circumstances leading to this miraculous trip and try to understand its implications on the life of the Prophet SAW and subsequently on the whole ummah. According to the majority of reports, the journey took place roughly about nine years after the revelation started. These were not easy times for Prophet SAW, for despite devoting all his time inviting people towards Islam not many had responded to his call. Leaders of Makkah were brutal in their retaliation tactics against Islam and their torture of Prophet’s companions was a source of constant agony for him SAW. During this time, Prophet SAW had two main supporters—his wife, Khadijah RA who was a source of constant moral and financial support for the Prophet; and his uncle Abu Talib, who although never embracing Islam himself, was the source of protection for Prophet SAW within the community. Khadijah RA passed away during this year followed by Abu Talib which snatched emotional as well as physical support from Prophet SAW. It is important to elaborate on the role of these two people in Prophet SAW’s life to feel the full impact of suffering our beloved Prophet went through. Khadijah RA was a pillar of support for Prophet SAW during the first years of revelation. She was the first woman who embraced Islam, and gave her unconditional, unquestioning and unwavering support to the Prophet in his attempts to spread the message. She was a very noble and dignified person and Prophet SAW often turned to her for wisdom and advice. He SAW often relied on her insight and opinions, which time and again proved to be invaluable. She was also a source of moral, emotional, and financial support for her husband. It is a known fact that she was one of the wealthiest business-owners in the Arabian Peninsula when she married Prophet SAW, and that she subsequently spent all her wealth in the path of Allah SWT to the point she passed away having nothing in her possession. So outstanding was her moral character that before she passed away, she received the glad tidings of her abode in Paradise. Very few people in the history of Islam have received such high spiritual status. Therefore, it is not hard to imagine what a devastating impact her death had on Prophet SAW. It left a void in him that no one was able to fill; even years after her death Prophet SAW used to grieve over her loss. The death of Khadijah RA was shortly followed by the death of Abu Talib. With no one left to support the Prophet and grant him protection, Quraysh tribe was free to persecute him SAW and the Muslim community as never before. He SAW was alone emotionally, and broken financially. At this point he had no means or status in society, he was devoid of emotional support, and his attempts to spread Islam were not bearing any results. Prophet SAW visited the nearby city of Taif to preach the message of Islam and to seek asylum from the Meccan oppressors but he was mocked, attacked and chased out of town. Ridiculed by society and labelled a liar, possessed, and a madman, he was all alone during these difficult trials and tribulations. It is not hard to understand why this turbulent period of his life was referred to as the Year of Sadness or ‘Aam al Huzn. It was during these trying times, when circumstances had reached such low levels— almost beyond normal human endurance, that Allah SWT sent Angel Jibreel to invite the Prophet SAW to the most wondrous journey that anyone had ever experienced. The trip was a mercy and support from Allah SWT to let his Prophet know who the real director of events is. It was a gift from Allah to His beloved in order to ease his suffering and to reveal things which Prophet SAW had believed in his heart but had never seen with his eyes. The details of the journey are so stupendous that it requires total and utter faith. None of us will ever see even a fraction of what the Prophet SAW witnessed but as Muslims we believe in what we were told by our beloved Prophet SAW. For example, we all believe in the existence of angels however none of us have ever seen them; similarly we believe in the afterlife and existence of paradise and hellfire without witnessing them with our eyes. Based on our understanding of physics, the concept of someone traversing the seven heavens and conversing with unseen beings defies all known logic; therefore it has been debated whether this journey actually took place, or whether it was a vision. This is where the reality of faith in the unseen comes in. 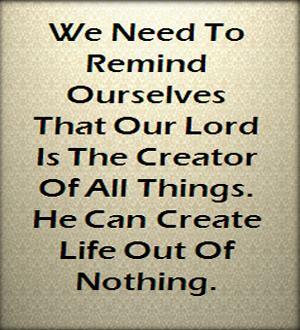 We need to remind ourselves that our Lord is the Creator of all things. He can create life out of nothing. He created the galaxies in their complex and perfect order. He created the smallest bacteria with absolute perfection down to its miniscule details that we cannot ever replicate. Therefore, we must remember that things such as physics, dimensions, space, time and distance are creations of Allah, and by His Supreme command all these laws can be changed and suspended. Isra and Mi’raj transcended all these concepts as we understand them on earth. Therefore, the majority of scholars believe that this journey happened physically, with the body and soul of the Prophet SAW. Prophet SAW was standing near the Ka’bah one night when Angel Jibreel approached him with a beast described as being an animal between a mule and a donkey called Burraq. Its speed was such that its hooves would touch where his gaze fell. This part of journey known as Al-Isra or the night journey took place between Mecca and Jerusalem. Burraq bore Prophet SAW on its back and in an instant transported him to Masjid al-Aqsa in Jerusalem, a journey that at the time took 40 days. 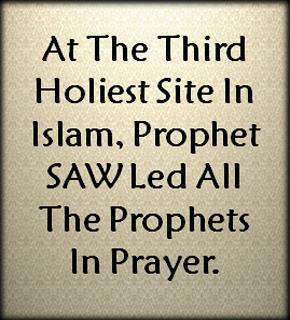 Here, at the third holiest site in Islam, Prophet SAW led all the Prophets in prayer. Upon his return Prophet SAW was able to perfectly recount the details of this journey, the place, buildings, and even the caravan that was on its way back from Jerusalem. This not only verified his claims and discredited the Quraysh mockery, but also strengthened Muslims in their faith. He SAW, accompanied by Jibreel AS ascended from heaven to heaven and was introduced to some previous prophets of Allah including Adam, the father of all mankind, Isa and his cousin Yahya, Yusuf, Idrees, Harun and Musa— peace and blessings of Allah be upon them all. On the seventh heaven, Prophet SAW saw Al-Baytil-Ma'mur, a building that is identical of the Holy Ka’bah in Makkah, and is situated exactly on top of the earthly Ka’bah. At any given time there are 70,000 angels making tawaf around it, a practice that will last till the end of times. There, Prophet SAW met and exchanged greetings with his father and the friend of Allah, Ibrahim AS. At Al-Baytil-Ma'mur, Prophet SAW was offered a cup of wine and a cup of milk and was asked to choose between the two. Prophet SAW chose milk and at this Jibreel remarked that Prophet SAW had chosen fitra—nature, over artificial and thus he and his followers will be on the natural religion of Islam. Prophet SAW witnessed the magnificence of Paradise, which is promised to the followers of truth. He SAW was also shown hellfire and the horrific tortures which await those who perpetrate corruption on earth. He SAW related to us the tortures specific to some crimes such as backbiting, adultery, usurping the money of orphans and eating riba (usury); things that we commonly indulge in and need to be warned against in strictest words. Finally, Prophet SAW ascended to Sidrat ul Muntaha–the boundary beyond which no one can pass. At this point, Angel Jibreel parted from Prophet SAW and he went on alone to meet his Lord, Allah SWT. 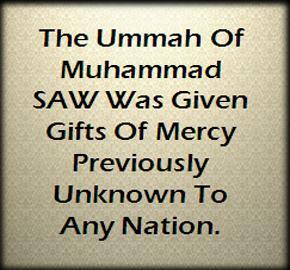 It is not known in which form the Prophet SAW beheld Allah SWT. There is speculation on whether Prophet saw Allah in His true form or whether he saw the light of Allah. However, such details do not make a difference in the overall lesson and wisdom that we can gain from Isra and Mi’raj. What is important though is that during this meeting the Ummah of Muhammad SAW was given gifts of mercy previously unknown to any nation. One of the most important gifts that Prophet SAW received during Isra and Mi’raj was salah. 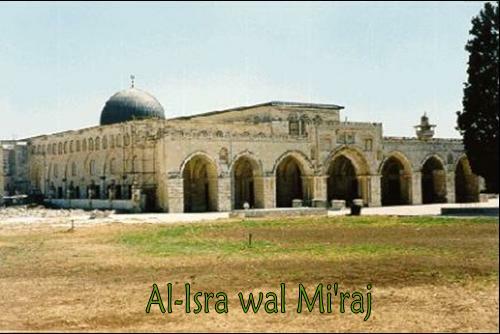 Prior to Isra and Mi’raj salah was known in a different form than what Muslims observe. The form of salah as we know today was revealed to the Prophet during his meeting with Allah SWT beyond the seventh heaven. Originally it was prescribed to be observed fifty times a day for Muslims. On his return from Sidrat ul Muntaha, Prophet SAW passed by Musa AS who persuaded him that his followers would not be capable of fulfilling this task and to ask Allah for reduction. Prophet SAW returned to Allah a few times and each time it was reduced by 10 in number until Allah ordained five prayers during the day and equalled them in reward to fifty. Thus, the second pillar of Islam was established in the heavens. Isra and Mi’raj hold lessons for all believers till the Day of Judgment. 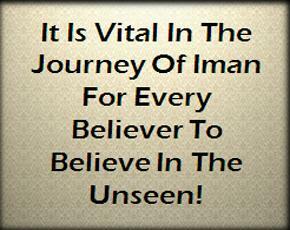 It is vital in the journey of Iman for every believer to believe in the unseen and to have faith that Allah is sufficient for us. Through Isra and Mi’raj, the followers of Prophet Muhammad SAW have been given a glimpse of what awaits them in the hereafter, and what exists in the dimensions beyond our own. We should remember that this journey happened at a time of extreme adversity during the Prophet’s life and despite all the hardships he remained steadfast and patient. Although the circumstances around him were enormous his faith was never shaken, hence he was rewarded with this wonderful journey. The lesson for us is that whenever we are facing adversity, feeling weak, and oppressed, and all our means have been cut we should go back to Allah, rely on Him alone, have faith, and be patient. The believer relies totally and utterly on Allah and no one else, and deals with his situations according to the teachings of the Prophet SAW. The way to overcome our calamities and tribulations is by getting closer to Allah, by crying to Him SWT and surrendering ourselves totally to His will—while believing that whatever is happening is best for us. We have to remember at all times that we are in this world which is in reality a testing ground. Allah constantly tests us; our belief and character is reflected by the way we deal with these tests and tribulations. 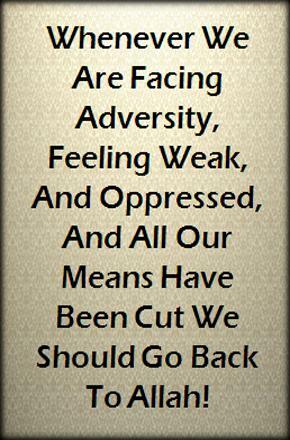 In the face of oppression, the Prophet SAW dealt with his oppressors with kindness, mercy and forgiveness. While it is easy to be generous to a generous person, and kind to other kind people; the true test of our character and faith is when we are able to treat our oppressors with kindness and generosity in the manner demonstrated by the Prophet SAW. Instead of questioning our situation we should always question ourselves about what Allah expects from us. Before we experience victory, we will be tried. We should remain focused and decide which path to take while keeping our ultimate goal of reaching jannah in mind. This will prevent us from straying from the right path when we are tested. If we understand Islam, we will understand that no situation is too tough for us to handle as believers–we should face all situations with patience and contentment while relying on Allah to show us the solution. Isra and Mi’raj is not a fiction, it is an experience and journey that all of us should spiritually perform. When Allah showed Prophet SAW the extent of His power and command, he SAW came back more calm and reliant on Allah, and this is what he SAW communicated to his followers. The lesson in it for us is that Muhammad SAW’s Lord is our Lord; time, space and distance are all His creations; similarly paradise and hellfire are not abstract concepts but real places which physically exist—and one of them is our final destination. We have been given sufficient descriptions of each to decide for ourselves which path we should take, and Allah has shown his infinite mercy and compassion to help us choose the right path. Compared to the nations of the previous Prophets and Messengers, it is clear that the nation of Prophet Muhammad SAW has been showered with more mercy and compassion than any other. Allah has lightened the burden on us, and multiplied the rewards of our deeds. No other nation has enjoyed this extent of forgiveness and forbearance from Allah SWT. Is this not proof of Allah’s boundless generosity to us and sufficient encouragement for us to remain strong in the path of Allah? Most of all we have been given salah, the most intimate way of worshipping and communicating with Allah which none of the previous nations were blessed with. Therefore, regardless of when Isra and Mi’raj actually took place, we should celebrate it, and the real celebration is to honour the message and purpose of the journey and to live according to the lessons it holds for us.